As good as the flat colors are (OD, Gray or Khaki), they do essentially lack the disruptive element which is crucial when there is available cover, and where ranges of engagement exceed those of built up populated areas. Our Mutifractals all under copyright (Fracture patterns as we refer to it) still use 4-6 colors but are better able to confuse or trick the brain into ignoring the pattern or forcing the brain to see only certain parts of the pattern so the actual soldiers shape is not given away. The Fracture patterns usually incorporate different size fractals throughout the pattern, most are graphics based on real objects found in nature, these recognizable shapes further trick the brain as the brain subconsciously ignores common patterns and colors. These elusive multifractals for camouflage have now been discovered and patterns have now been developed using our proprietary graphics techniques known as C2G (Camouflage Designated Enhanced Fractal Geometry CDEFG). A few of the fracture patterns that have been developed use fractals that are found in most global regions, such as Fracture 38 Cracks; This Fractal is found around the globe in both natural and populated areas. Temperate &Tropical (Tree Branches) / Desert - (Arid ground & Salt Flats) / Urban - Cured, Aged Concrete. So this one pattern could be used around the world under different color schemes without modifying the initial pattern. You'll notice different elements of the fractures can be pulled out and placed into another pattern such as Fracture 39 D3P with Cracks which combines Fracture 38 Cracks with Fracture 10 D3P. Special Forces may require a limited number of uniforms (Under 5000 yards required). There are provisions for such orders but the uniforms may be more expensive to manufacture, than would a uniform made from a 5000 yard run. 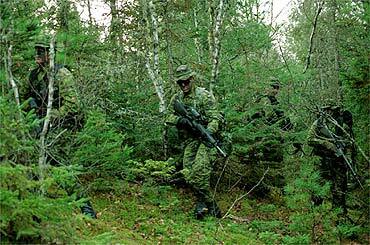 Further information on the subject of digital Camouflage go here:Digital Camouflage History: Who did it first; Canada or the US? Fracture Camouflage is a Trademark of HyperStealth® Biotechnology Corp.
C2G-Camouflage is a Trademark of United Dynamics Corp.